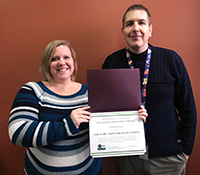 The Eau Claire County Recycling Division received a Projects and Initiatives Award from DNR for focusing on education through a multi-faceted communications plan. The county wanted to improve its residents’ access to information about recycling and proper disposal of various waste types. It created a new Recycling and Disposal Guide and mailed it to all residents. The county revamped its website to include more images, hyperlinks, graphics and also the new guide, which receives about 350 views per month. The county increased its social media postings to five per week and its Facebook posts reach 23,600 people. The county’s Summer Clean Sweep recycling event had the largest turnout on record. Learn more here.